Follow the Pirateprofessor on Twitter. 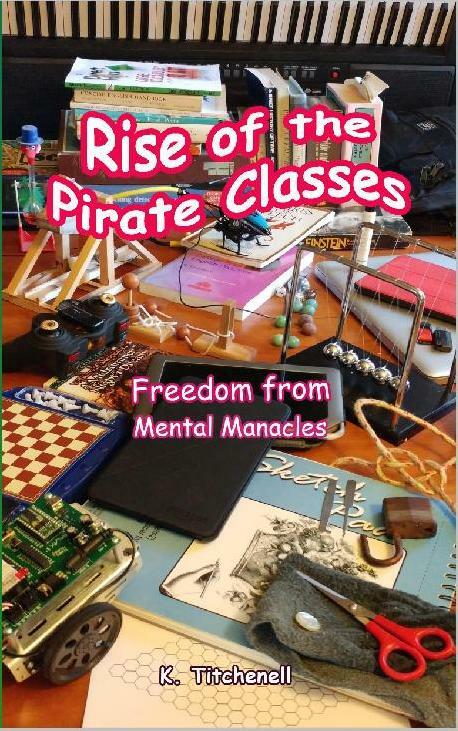 Rise of the Pirate Classes—Being the story of a diverse group of young, self-organizing home schoolers who discover the joy of learning when they can set the agenda (or curriculum) rather than having it forced on them. The unschoolers’ path leads them to dive into history, politics, and economics…into literature, music, and drama…math and computer science—and to practice the more practical and physical arts of flying drones, picking locks, and engaging in parkour. A book that practices what it preaches—it provides a multitude of jumping off places for the reader to follow interesting leads and explore the widest variety of topics on her or his own. As such, this book is not just for home schoolers and their parents—but really is suitable (which means ENJOYABLE) for everyone, of all ages! To anyone contemplating home schooling their children or just wish to understand the reasons why people choose home schooling, this excellent and very readable book outlines the amazing benefits of leaving the regimented and often creative killing and unlearning of the regular school system. Reminding me of dreaded and stultifying days at school this book shows there really is another and far superior path to learning. A fast moving and inspiring factually based novel that even at my advanced years I find myself considering and learning something new in each chapter. Rise of the Pirate Classes is a novel about a group of middle school students who, with parental support, pursue a student defined curriculum and in doing so, discover delights of learning. Using modern networking tools and contacts, this pirate class develops its own very effective study methods and discovers the degree to which compulsory schooling serves more to stifle and inhibit scholarship than to foster it. The students also find that the approved and official textbook versions of subjects and events are always fragmentary and often skewed and fallacious but that criticism of official versions is not tollerated. The compulsory schooling agenda enforcing compliance and conformity in a docile and indoctrinated populace is well documented in extensive works by education theorists, but such works are unlikely to be read widely by students. Rise of the Pirate Classes is more accessible narrative adventure fiction about overcoming adversity, battling entrenched mindsets, inventing creative solutions and making contributions that can have a positive effect on society. With their network world of resources, tools and experts happy to provide the occasional needed consult, learning for the Pirates promises to become an exultant and massively successful experience. But this path of free inquiry and open libraries is fraught with danger from forces ever watchful for threats of uncontrolled democracy and faces powerful opposition at every turn. There are helpful friends to be found among the fellow travelers on that path as well though. Rise of the Pirate Classes does not intentionally take any one political or philosophical stance but does endorse conscientious circumspection, questioning of official positions and opinions and subjecting them to scrutiny. K. Titchenell was a victim of public school but, after some years of recovery, managed nonetheless to find delight in real education and went on to teach at various times English, Computer Science, German, Music Theory and Composition, Aikido, Mathematics, and Poetry/Songwrting. The Titchenell family homeschooled/unschooled their children. Though K. Titchenell holds a number of academic degrees and certifications, these are utterly irrelevant as the classroom is rarely where real learning takes place. Prof. Titchenell has been teaching homeschool classes at Excellence In Education, the definitive homeschooling resource center in Monrovia CA, since 2002.